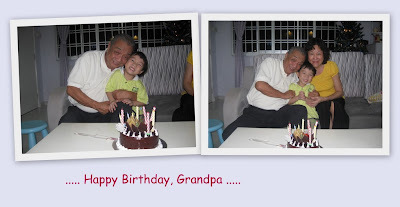 On Sat, we celebrated Grandpa's birthday at Kublai Khan's Mongolian BBQ @ Park Mall. As usual, Grandpa always goes for the sashimi, tuna & crayfish, what he calls 'expensive stuff'. Actually, the food was so-so only, think we've tried better. 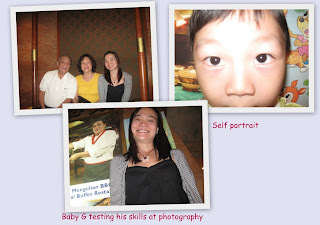 Baby G, however, enjoyed himself very much. He followed us everytime we went to get our food. He didn't really eat that much, but we managed to get him to eat 2 slices of apple which is a lot considering that he simply dislikes fruits. After dinner, we went back to PR to finish off with the singing of the birthday song & the cake cutting. We sang the song in 3 languages and 1 more additional song that was 'composed' by Baby G himself. Actually, he simply sang 'Hoo Wah Hoo Wah....' to the tune of 'Happy Birthday To U'.